Eighteen students are facing charges in connection with Timothy Piazza's death. A former Penn State fraternity member charged in connection with the death of pledge Timothy Piazza at the fraternity house earlier this year allegedly texted his girlfriend "drink hazing can send me to jail," and "I don't want to go to jail for this" after the pledge suffered what turned out to be a fatal injury. "I think we are f-----," the ex-fraternity brother allegedly said. Piazza, a 19-year-old sophomore and pledge at Beta Theta Pi, died on Feb. 4 after he fell down the stairs during a night of drinking for a pledge ceremony at the house on the night of Feb. 2. In text messages, fraternity members refer to the pledge ceremony drinking as an "obstacle course." Fraternity members did not call 911 until the morning of Feb. 3, about 12 hours after Piazza's fall, according to a report on the grand jury's investigation. Piazza's death "was the direct result of traumatic brain injuries," according to the forensic pathologist. Prosecutors claim the former fraternity brothers at Beta Theta Pi waited to get Piazza help in an attempt to cover up their drinking and "coordinate a story." Eighteen Penn State students are facing charges: eight for involuntary manslaughter, aggravated assault, reckless endangerment, and hazing, among other charges; four for reckless endangerment and hazing, among other charges; and six for evidence tampering. The Beta Theta Pi fraternity -- which has since been barred from Penn State -- is facing charges including involuntary manslaughter and hazing. No defendants have entered pleas at this time. 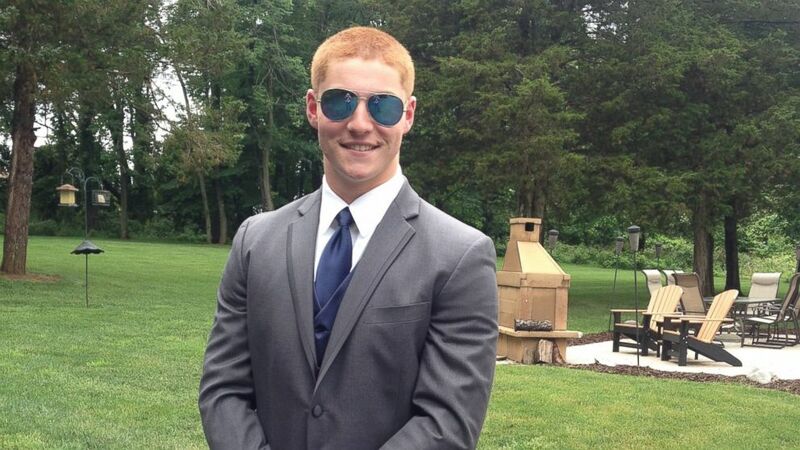 (Courtesy Piazza Family) Tim Piazza, a 19-year-old Penn State sophomore and pledge at Beta Theta Pi, died on Feb. 4, 2017 after he fell down the stairs during a pledge ceremony at the house on the night of Feb. 2. At a preliminary hearing today, prosecutors revealed texts and internet searches allegedly sent and made by some at the fraternity house. After the hearing, a judge will decide if there is enough evidence to go to trial. Other texts revealed by prosecutors today that were allegedly sent by some of the then-fraternity brothers, said, "I think after this we could be kicked off." Someone allegedly texted, "When they see the video footage of the obstacle course we will be done." One then-fraternity member allegedly asked, "What times did they take tape of?" and another member replied, "Nah, they took tapes from 7 to 9:30am." "F--- yes," the first fraternity brother responded. "We should be good," the second fraternity brother said. After Piazza's injury, one of the fraternity members allegedly texted another, "Make sure the pledges clean the basement and get rid of any evidence of alcohol." Another text said, "Make sure the pledges keep quiet about last night and this situation." Prosecutors also said one of the young men did an internet search for: "How would 9 drinks in an hour affect a 200 pound guy." In the days before the party, receipts show fraternity members bought nearly $700 worth of alcohol, prosecutors said today. Then today it was the defense's turn. Frank Fina, an attorney for the former fraternity president, questioned a detective who said it is unclear how much alcohol Piazza had during the "obstacle course" hazing ritual as opposed to the separate party in the basement. Fina said that two Penn State-hired "social checkers," provided by private security company St. Moritz Security for the Infrafraternity Council, attended the party that night. Prosecutors have suggested that the fraternity somewhat cleaned up before the social checkers' arrival. The detective testified there was no evidence showing that anything was cleaned up, citing alcohol boxes in the lobby when the security guards walked in. The detective said the social checkers went to the party nine minutes before Piazza's fall, and were inside the house for two to three minutes. The detective said it's probable that Piazza and the social checkers were in the basement at the same time, when Piazza was visibly very drunk. Video reportedly shows the social checkers leaving the party shortly before the fall. The detective on the stand admitted that the social checkers were not interviewed and the detective said he does not know if the social checkers filed any complaint. St. Moritz Security declined to comment. Fina asked the detective if anyone physically threatened any pledges to drink, or if anyone threatened to harm pledges, and the detective said not that he was aware of. Fina asked if it's fair to say the pledges could have left at any time, and the detective said yes. The preliminary hearing began last month with the prosecution's showing of surveillance video, as well as testimony from a detective. Piazza's fall was not seen on video, but it shows him after the fall being carried upstairs by four fraternity members with a large bruise visible on his body, which prosecutors say was from a spleen injury. The brothers put Piazza on a couch but did not stabilize his head and neck, the video appears to show, and the 19-year-old fell off the couch. 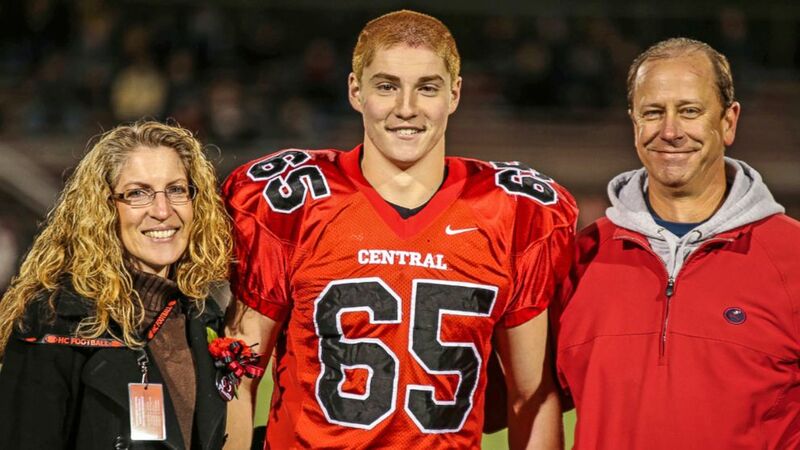 (Courtesy Piazza Family) Tim Piazza, a 19-year-old Penn State sophomore and pledge at Beta Theta Pi, died on Feb. 4, 2017, after he fell down the stairs during a pledge ceremony at the house on the night of Feb. 2. The video appears to show the fraternity brothers putting a backpack on Piazza so he would not roll onto his back and choke on his vomit; as they placed the backpack on, Piazza's head snapped backward and moved frequently. That night Piazza’s blood alcohol content reached three times the legal limit. At one point, the detective testified the video appears to show one fraternity brother grabbing Piazza's shoes and throwing them at him. The same brother appears to hit Piazza in the abdomen area, the detective testified, which his defense attorney contested in court. Around 3 a.m., Piazza gets up and falls to the floor, hitting his head again. A fraternity brother starts to drag him, the video appears to show, and then leaves him on the floor, throwing a blanket over him. About an hour later, while the video is in black and white in night-vision mode, it appears to show Piazza moving into the fetal position many times, also cradling his head a few times. Later the video appears to show Piazza get up and walk into a wall, and then fall head first. Next he gets up again and walks into the side of the stairs railing, and falls down onto the stone floor, the video appears to show. Piazza gets up again and walks toward the front door, before he staggers and slams into the door, the video appears to show. Throughout the night, Piazza is rolling on the floor, getting up, stumbling back down and slamming into the stairs or furniture, the video shows. At one point, a brother comes over to him, Piazza gets up and walks with him, then falls down another set of stairs. The fraternity brother apparently leaves him on the ground. All night long, Piazza is either holding his stomach, lying down in a fetal position, or holding his head. Around 7 a.m., a fraternity pledge was sitting on a couch watching Piazza, and took either a photo or video of Piazza in that condition, a detective said in court. After the pledge left the room and Piazza was alone, Piazza went to the basement. Two hours later, he was carried out of the basement by four fraternity brothers. The fraternity brothers were seen standing around Piazza but the prosecution pointed out that no one administered CPR. A few brothers appear to touch him or shake him, the detective testified the video shows. As the minutes tick by, without calling for help, prosecutors said "it appears they are cleaning him." Fraternity members tried to dress Piazza but couldn't because his body was too rigid, the detective said. Forty-two minutes after finding Piazza in the basement and first realizing he was cold and stiff, a fraternity member called 911 and other fraternity members cleaned up "evidence of beer and alcohol," the detective said. One defense attorneys in the case told ABC News earlier, "Of course, it's a tragedy. But that doesn't mean there's any intent involved in any of this." A defense attorney for Joseph Ems Jr., one of the frat brothers charged in the case with reckless endangerment, said his client was one of many people present that night who was unaware of the extent of Piazza's injuries. "This is not somebody who's got a gaping head wound that's gushing blood. This is somebody who's blood alcohol was three times the legal limit and apparently had some internal injuries," said Ems Jr.'s attorney, William J. Brennan. "He probably looked like just another frat kid," Brennan said. Brennan told reporters today, "The tape tells the story and my client's on the tape for about 14 seconds of a 12-hour tape. And in those 14 seconds, I don't see anything that's remotely criminal in this tragic, horrific situation." Brennan added, on behalf of the Ems family, "I again offer my condolences to Mr. and Mrs. Piazza." Piazza family attorney Tom Kline told reporters today, "The Piazzas have sat there as patiently as any grieving parents could possibly do to try to come to grips with this terrible barrage of evidence all of which collectively demonstrates that there was a callous and reckless disregard for their son’s life." "He was left to die and the evidence shows that," Kline said. "There were text message after text message shown in this courtroom today ... all of which collectively demonstrate a callous disregard for one human being and a senseless need to try to preserve their own situations." (Patrick Carns via AP Photo) Timothy Piazza, center, with his parents Evelyn Piazza and James Piazza in Flemington, N.J., Oct 31, 2014. Kline told ABC News last month, "Seeing the videotape of the young man who was force-fed alcohol, had his own shoes thrown at him, beer thrown on him, punched, sat on ... It’s something that you just can’t think could be possible, anywhere, let alone in a fraternity house on a campus of an American university. 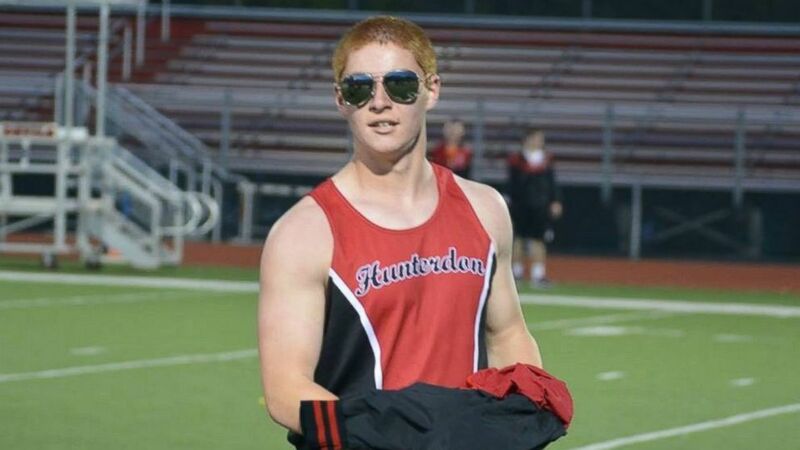 "The hardest part of the video for me to watch was to see Tim Piazza on the floor with no shirt on struggling for life alone, left alone in the middle of the night," Kline said. "Trying to raise to his feet in a praying position, and falling back down. There is no one who could see that whose heart wouldn’t cry and whose eyes wouldn’t shed tears." The Piazza family is planning on filing a lawsuit against the fraternity members and the university. 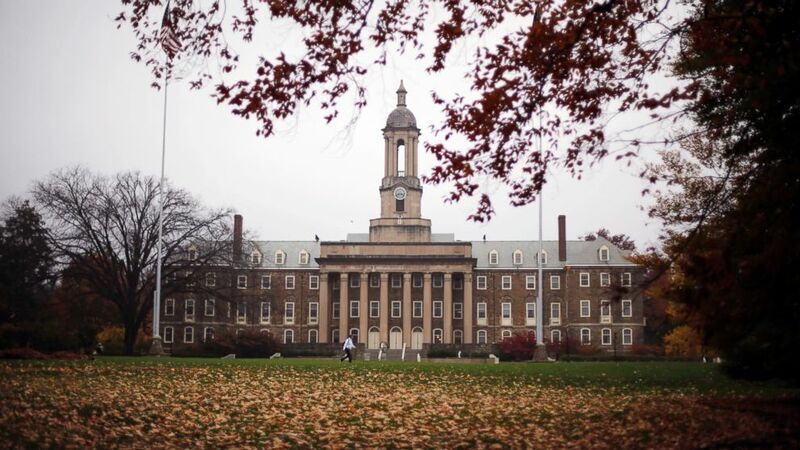 (Gene J. Puskar/AP Photo) Old Main on the Penn State main campus in State College, Pa., Oct. 28, 2015. Penn State has announced proposals for new safety reforms, including: having university staff members monitor social events; the university taking control of the fraternity and sorority misconduct and adjudication process; and permanent revocation of university recognition for any chapter involved in "hazing that involves alcohol, physical abuse, or any behavior that puts a student’s mental or physical health at risk." Penn State President Eric Barron said, "There are other measures being discussed and will be instituted over time -- all with a focus on prevention, monitoring and enforcement. These measures augment a series of actions taken earlier this year, which are being made permanent." Barron added, "I am resolved to turn the pain and anguish radiating through our entire community into decisive action and reform, concentrating on the safety and well-being of students at Penn State." Penn State's Interfraternity Council said, "We agree that added social restrictions, education, transparency and professional staff support are critical. We have tried to remain committed to being an active part of the solution within our community. We stand firm on our belief that when students are involved in collaborating with the university in monitoring and accountability, a greater impact is made. For that reason, we will continue to push for a partnership between student leaders and the university." ABC News' Stephanie Gomulka contributed to this report.